What is a problem? A problem is an obstacle, that has to be surmounted. Solving a problem is connected with obstacles. Or more general: Problem solving is a process to get from an unsatisfactory to a satisfactory situation. Most of us get paid for solving problems. It’s irrelevant if you are paid for solving technical problem (e.g. My computer doesn’t work), or if you are paid to create solutions for customers (e.g. design infrastructure for a Citrix XenApp farm). At the end you solve a problem. Every problem has characteristics, that can be used to describe it. Not every problem is solvable. Think about “Squaring the circle“. But often a problem seems to be unsolvable because it’s not well defined. If Initial situation, obstacle and target situation are not clearly formulated, you won’t be able to solve the problem. If you can decompose a problem into multiple subproblems, it is a hierarchical problem. Otherwise, it’s an elemental problem. The effort to solve a problem is always different.. A problem is theoretically solvable, but it may require such a high effort, that it is practically unsolvable. Even if a problem is well defined, it appears different in regard to complexity for different people. Collecting information is the key. Collect information about what happened before, during, and after the problem has occurred. Identifying the root cause for a problem can be a time consuming task. But let me say this clearly: Information is the key. Information that help to find the root cause are not only observations (e.g. logs, error messages etc.). You can can use the results of systematic tests. Collect as much data as you can. Sometimes it can be useful to create a hypothesis. Scientists generally base scientific hypotheses on previous observations that cannot satisfactorily be explained with the available scientific theories. If you see that System A is affected, but system B should be affected too, but it’s not, it might be time to create a hypothesis. With a hypothesis in mind, you can try to prove it. Test the hypothesis by performing tests and collecting data. This strategy is called “hypothesis testing”. Sometimes it’s easy. But sometimes it’ not that easy. A trade-off analysis can help to identify the best of multiple solutions. With these steps, you should be well prepared. It doesn’t matter what kind of problem you are trying to solve: The process is basically the same. A3 Problem Solving has been developed at Toyota for their Toyota Production System (TPS). It’s an often used method in Lean Manufacturing. A3 helps to solve problems by pretending a structure (WHAT IS and WHAT IS NOT the problem, describe the problem, root cause, solution etc). This strucure is placed on an A3 sheet paper (that why it’s called A3). The process is based on the principles of Deming’s PDCA cycle. PDCA, or Plan-Do-Check-Act (sometimes Shewhart-Cycle) was made popular by Dr. Edwards Deming. 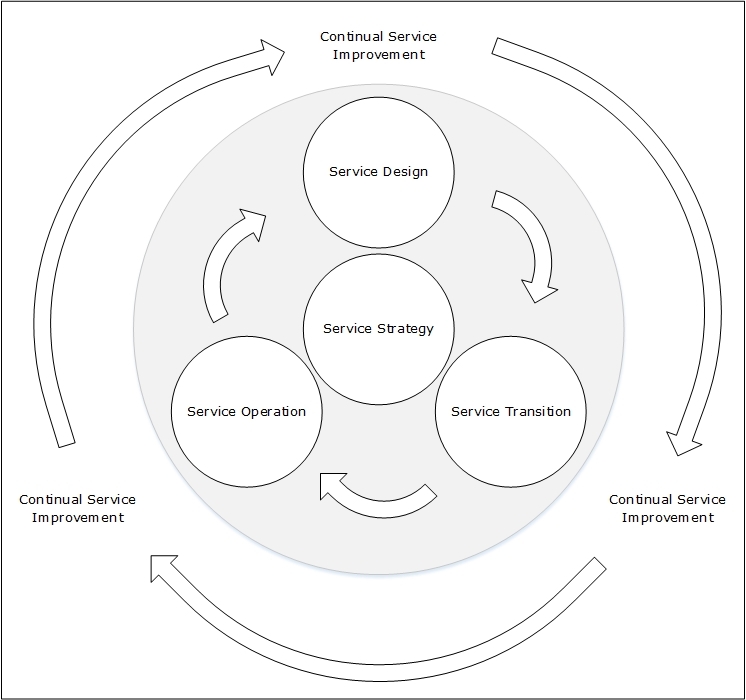 Plan-Do-Check-Act refers to the four phases of this cycle. Eight Disciplines (8D) Problem Solving was developed by the Ford Motor Company. The D0 phase is the starting point for the D8 process, but it’s not counted. FMEA is based on inductive reasoning (forward logic). FMEA is based on a highly structured process, which can be represented as followed. This entry was posted in Job and tagged job, operations management, troubleshooting on May 5, 2016 by Patrick Terlisten. I wrote about what’s new in vROps 6 and about the deployment of the virtual appliance. I also described how to migrate the data from the old vCOps vApp. Part 3 covers the decommission of the old vApp. Enter the IP or FQDN of your UI VM into the browser. Login as admin into the administration UI. 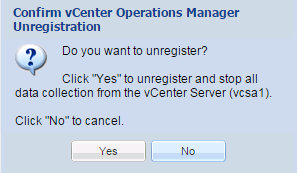 Before the vApp can be removed, the vCOps needs to be unregistered from the vCenter. Click “Unregister”. A confirmation pop-up appears. Click “Yes”. The process can take some time, depending on your environment. In my case the unregistration took about 5 minutes. That’s it. After the successful unregistration, the vApp can be shutdown and removed from the vCenter. Say good bye and enjoy your new vROps 6.0! 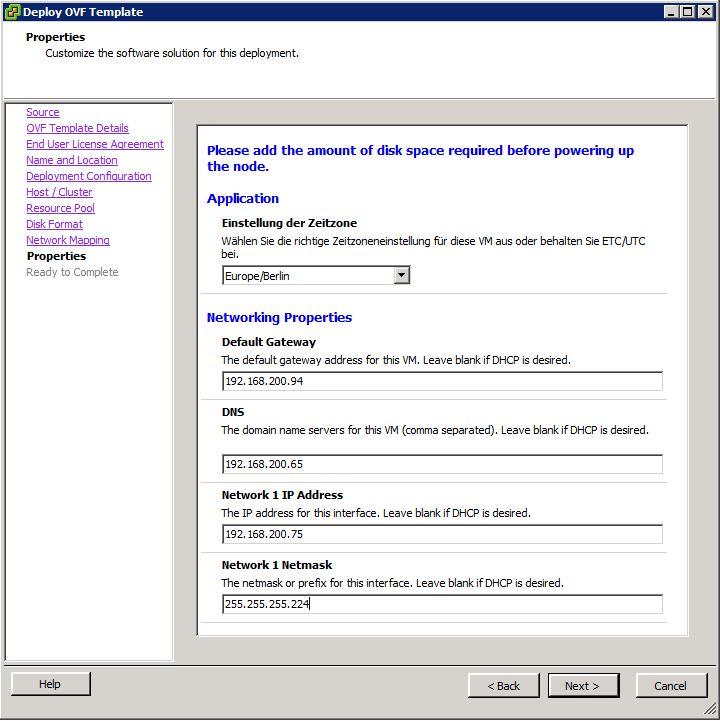 Some users complained about the absence of the Health Widget in the vSphere Web Client, after the removal of the old vCOps. Michael White (@mwVme) posted the solution: vSphere Web Client Health State Widget has errors after vR Ops Migration? Thanks to Michael for sharing this! 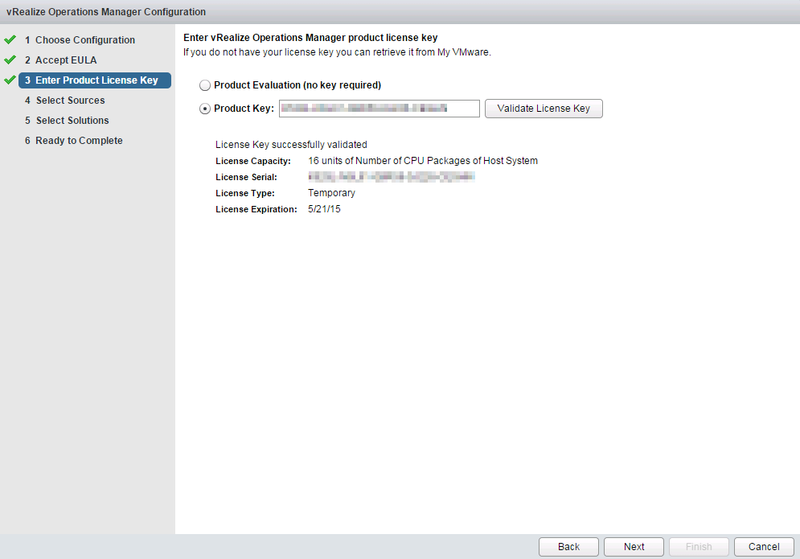 This entry was posted in Virtualization and tagged migration, operations management, vExpert, vmware, vrops on December 28, 2014 by Patrick Terlisten. Part 1 of this series has covered a short overview over vRealize Operations Manager 6.0 and the initial deployment of the virtual appliance. Now it’s time to bring it to life. Open a browser and enter the IP of your newly deployed vROps appliance. 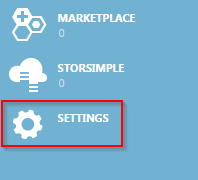 You will get this nice initial setup screen. “New Installation” is always a good start. Click “New Installation”. Within five little steps, the configuration of vROps will be done. You may have noticed the “Migrate Data” icon on the right of the screenshot. This will be important later. Start with clicking “Next”. 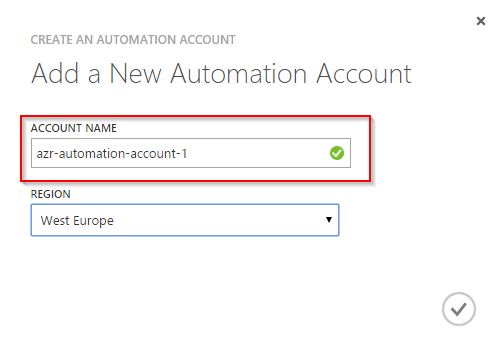 Enter the password for the build-in administrator account and click “Next”. I really liked part: Choose Certificate. No command line, no complex knowledge base articles. 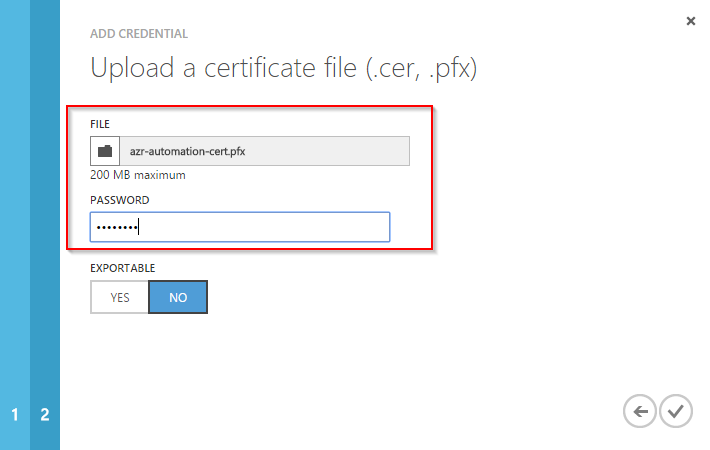 Simply choose “Install a certificate” and point the installer to a valid certificate. You can replace the certificate later. 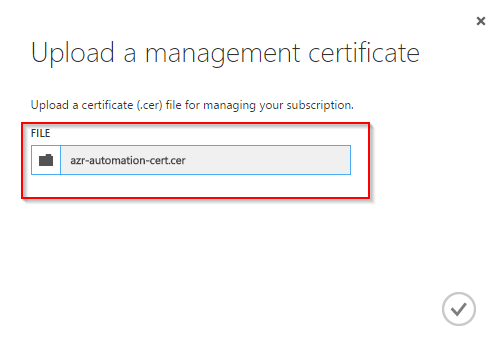 Because of this, I’ve chosen “Use the default certificate” at this point. Enter the name of the master node and a valid NTP server. In my case, the NTP server is my Active Directory Domain Controller. Complete the initial setup by clicking “Finish”. Now the vROps services must be started. 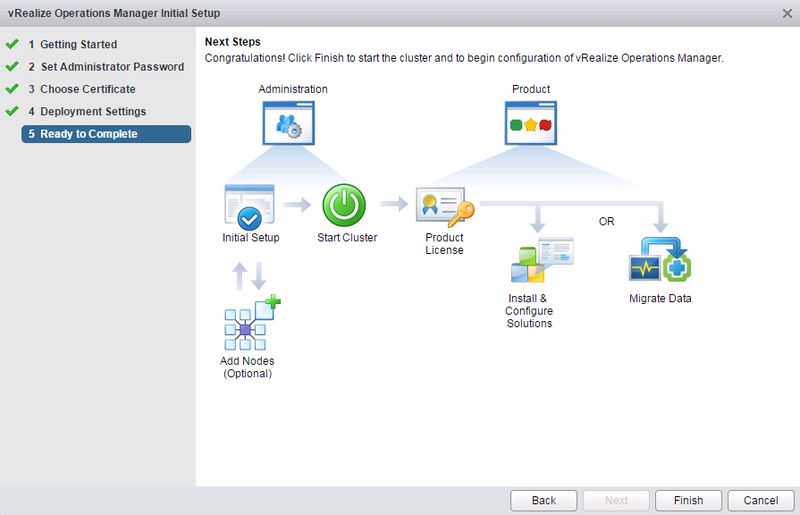 Click “Start vRealize Operations Manager”. The pop up can be answered with “Yes”. Log in with “admin” and the password you’ve chosen at the beginning of the initial setup. Because I already had a vCOps running in my lab, I’ve chosen “Import Environment”. 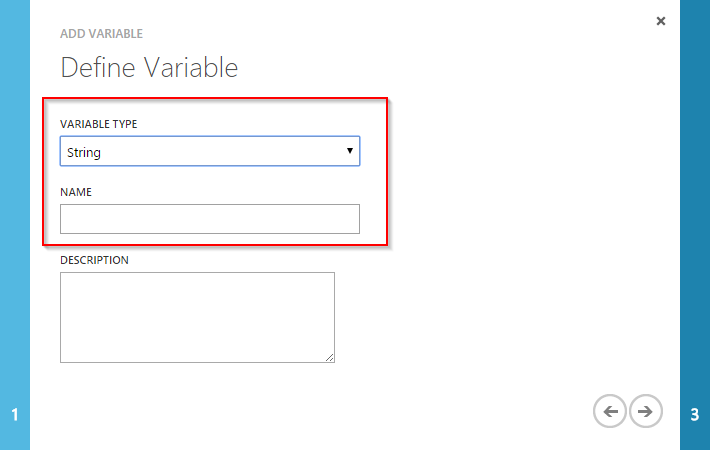 This selection allows you to import the data from your current vCOps vApp. Click “Next”. Carefully read the EULA, enable the checkbox and click “Next”. Now you have to add a license key. 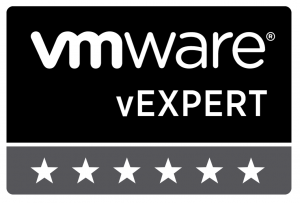 I used my vExpert vCloud Suite key. 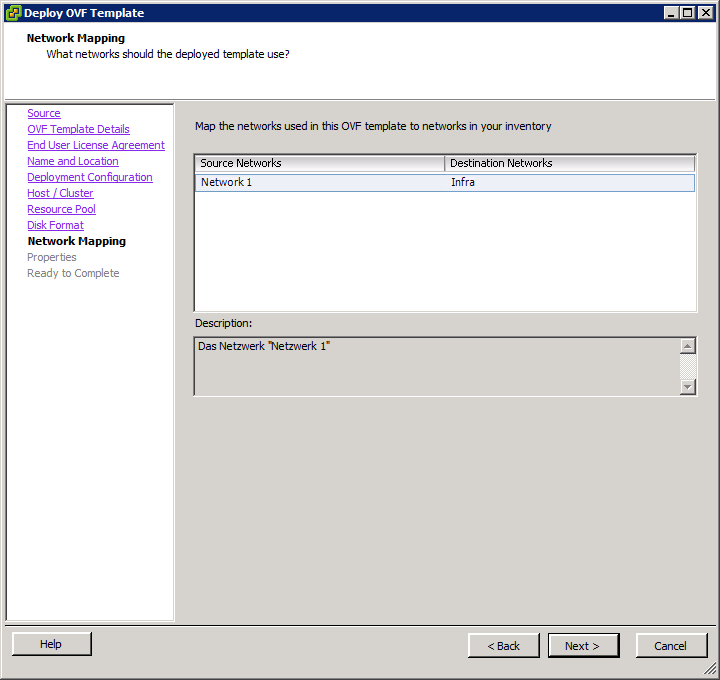 Enter the IP address or the FQDN of your current vCOps UI VM. 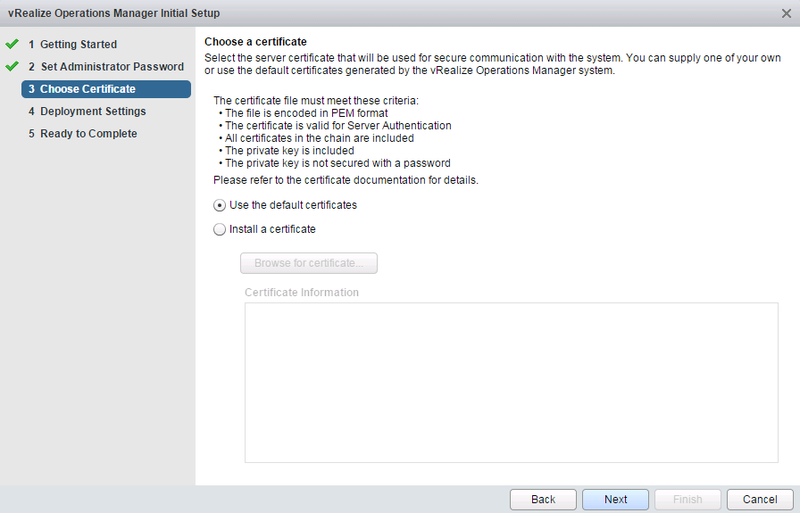 A pop-up appears that informs you, that an agent is pushed to the VM. This step takes about 5 minutes to finish. Click “Next”. You can add additional solutions at this point. This wasn’t necessary in my case. Click “Next”. Everything’s fine. Simply click “Finish” and relax. Now the data is imported. Depending on your resources and the amount of data, this step can take some time. In my case this step took about 10 minutes to finish. Congratulations! That’s it. Easy, isn’t it? Now you can add additional nodes, e.g. a replica node or additional data nodes. The migration process is really easy and straightforward. The database is the most valuable. Because of this, I strongly recommend to migrate the data from your current vCOps environment. But what to do with the old vCOps vApp? 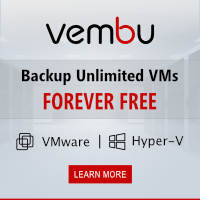 It’s still active and consumes resources from your vSphere cluster. I covered this in part 3 of this series. 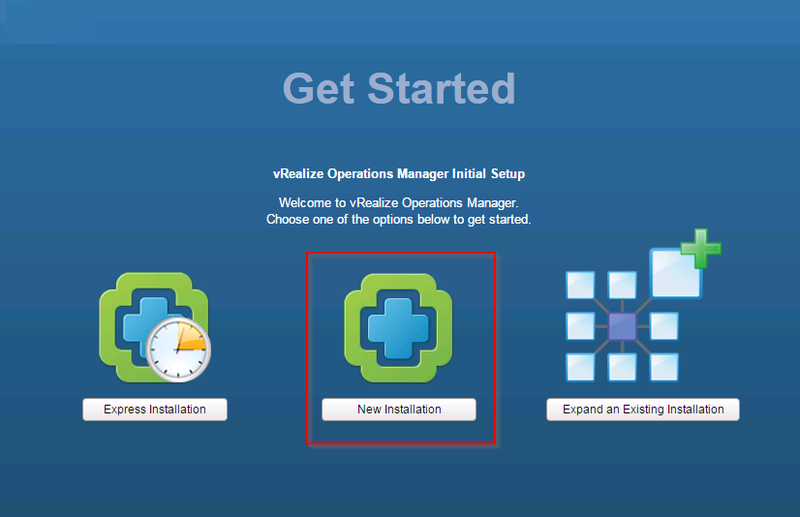 VMware presented the vRealize Operations Manager 6.0 at the VMworld 2014 in Barcelona. In early december, vROps was available for download. 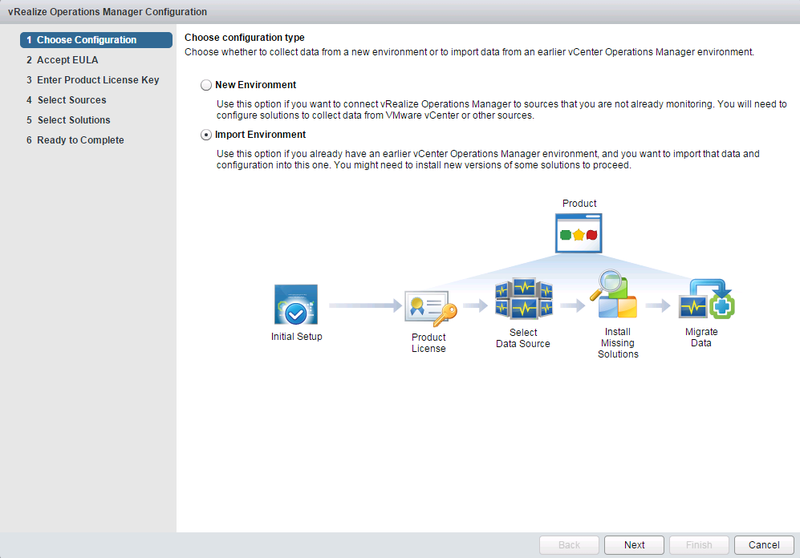 vROps 6.0 is the successor of VMwares IT Operations Management suite vCenter Operations Manager, or vCOps. VMware has aligned the naming scheme with other products, so this release is the first release under the new brand vRealize. VMware has made some major improvements to this release. One of the biggest advantages is the ability to scale-out. In prior releases you had to deploy multiple vApps to scale. 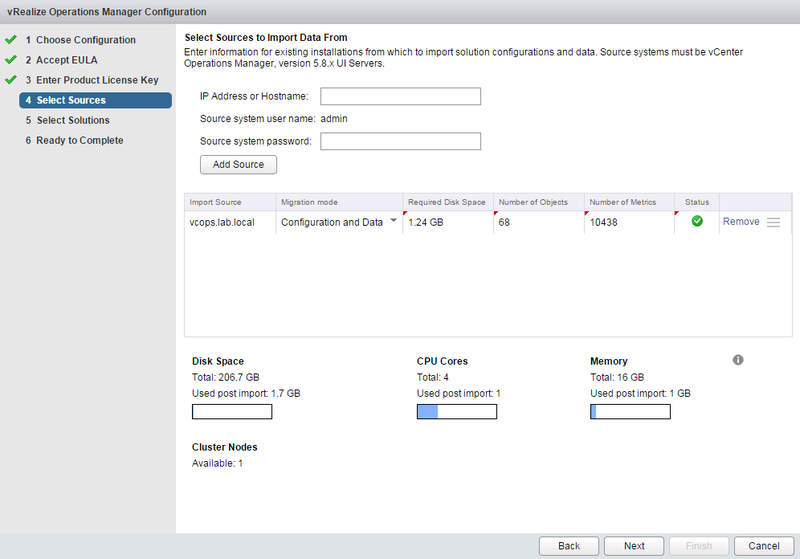 Now you can add additional vROps instances to a cluster. These appliances provide computing resources, as well as redundancy. This allows you to scale beyond the limits of vCOps 5. Redundancy is provided by a concept which is based on master, replica and data nodes. The fist node in a vROps deployment is the master node. By adding a replica node, you can add redundancy for the case that the master node fails. Master and replica node work in a active/ standby relationship. The data nodes are the secret behind the scalability of vROps. A data node has only one task to perform: Collect data based on the assigned adapter. An adapter is used to collect data from 3rd party systems and it’s provided by different available management packs. Check VMwares Whitepaper “VMware vRealize Operations Guide to Third-Party Solutions” for more information about availble management packs. From my point of view the management packs (which provide the adapters) for HP 3PAR (HP StoreFront), HP OneView, Brocade SAN Analytics, Microsoft SCOM or SAP CCMS are really cool. 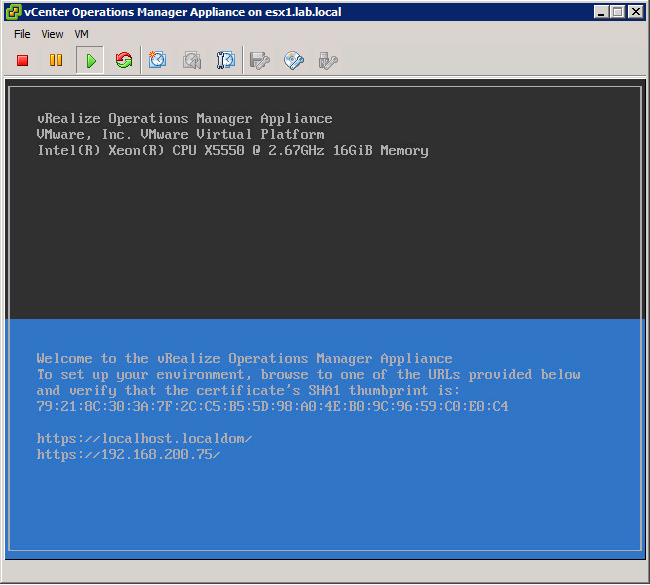 Just to make this clear: vRealize Operations Manager 6.0 is NOT focused on VMware! You can use vROps with available management packs to get a much better oversight over your IT infrastructure! VMware has also improved the user interface (UI). There is no need anymore to switch between different UIs. The management, administration and customer UI has been consolidated into a single UI. The first UI access after the initial deployment is redirected to a first-time wizard. 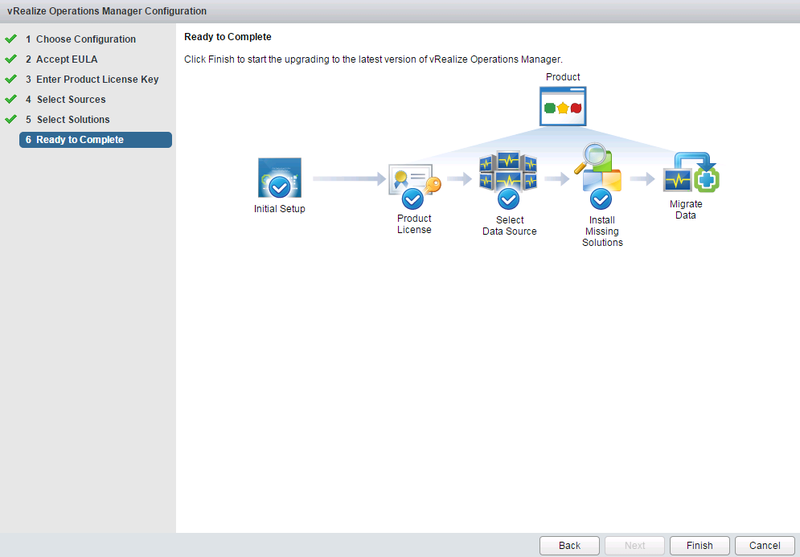 This wizard helps you to deploy vROps, or to migrate your vCOps environment. 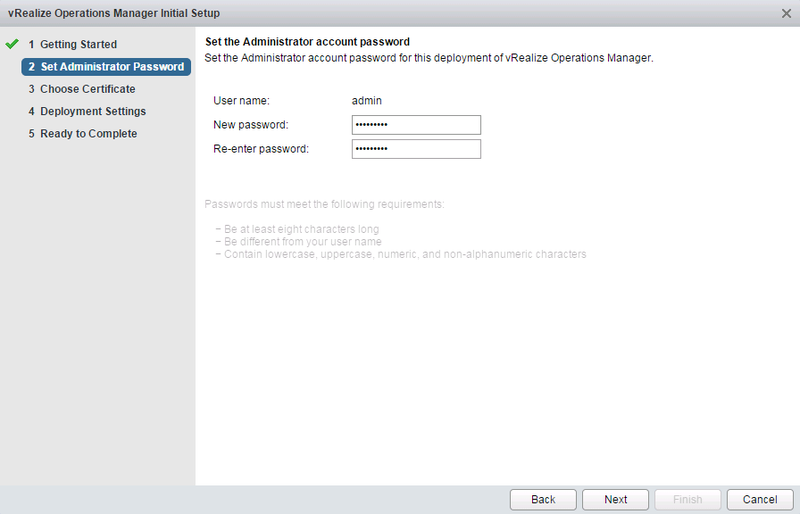 In addition to the UI changes, VMware has added RBAC to vROps to simplify user access management. When talking about the UI, it’s only a small step to the data visualization and reporting. The visualization of collected data is one of the greatest features of vCOps/ vROps. Only data visualization makes it possible to get a quick oversight over the current health of the IT infrastructure. Prior version of vROps included reports and some fixed dashboards. With the current release, vROps provides fully configurable reports and dashboards with the ability to include any data source, object or metric. Just think about the opportunities: You can build reports or dashboards across the whole stack, from the infrastructure to the application. Smart Alerts provide a way to trigger an alarm, when multiple symptoms are observed. This is much more flexible than the old alarms you know from vCOps. But even a dynamic threshold may be too inflexible in certain cases. Smart Alerts add more intelligence to the alarming system. When using smart alerts, an alert is triggert when multiple symptoms are observed. Now you know that something is wrong in your datacenter. But how can you solve this? vROps is able to execute basics operations as a reaction to a smart alert. 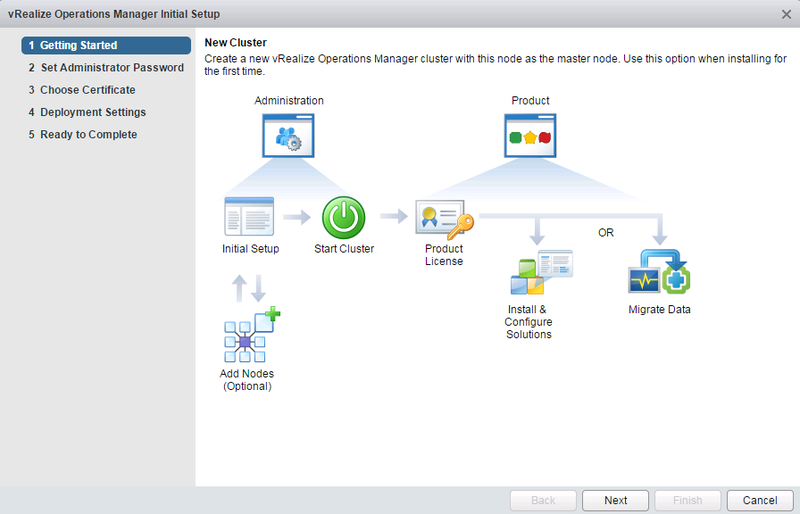 If you need more advanced reactions, vROps can utilize vRealize Orchestrator to accomplish this. Your datacenter will heal itself. The capacity management was improved. The well known “Demand & Allocation” based capacity model hasn’t changed, but it’s now not limited to vSphere objects. The capacity management can now include all monitored objects. VMware also improved the the “what-if”-analysis. This feature was now extended and is now aware of projects. With this feature, you can add future hardware purchases into a “what-if”-analysis. VMware dramatically improved the analysis and monitoring of the storage subsystem. Unified Storage Visibility can show you the correlation between applications and your underlying storage infrastructure in an End-2-End manner. 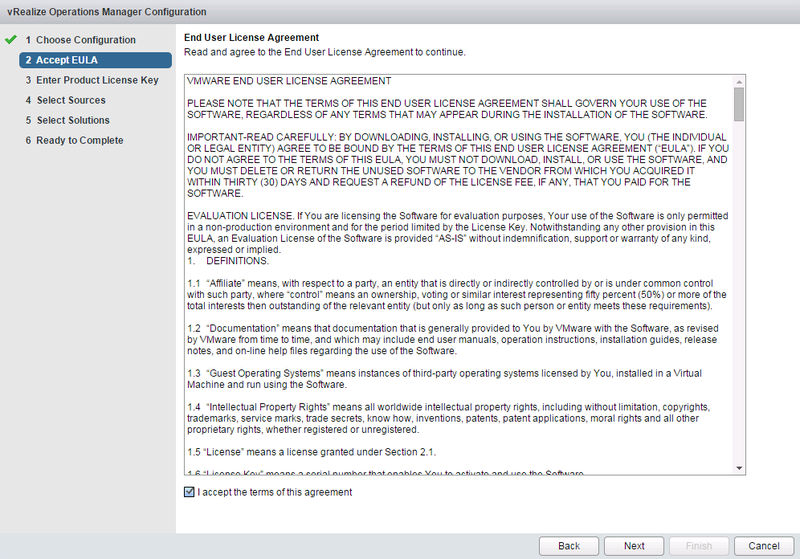 The licensing was simplified. Customers can now install multiple editions in the same vROps deployment. 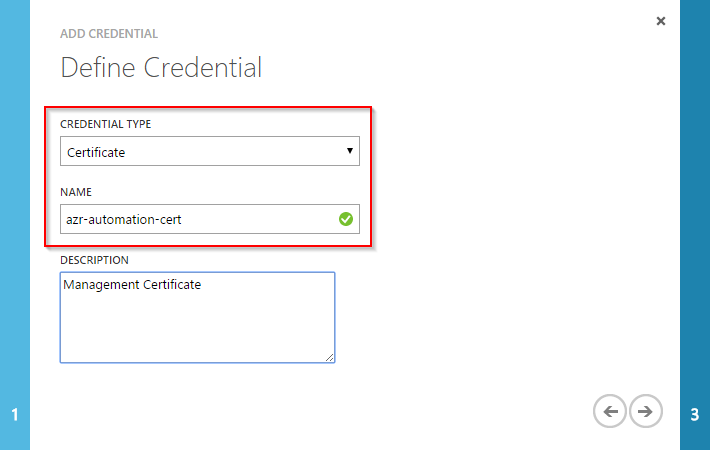 This enables customers to deploy a-la-carte and suite licenses together, e.g. 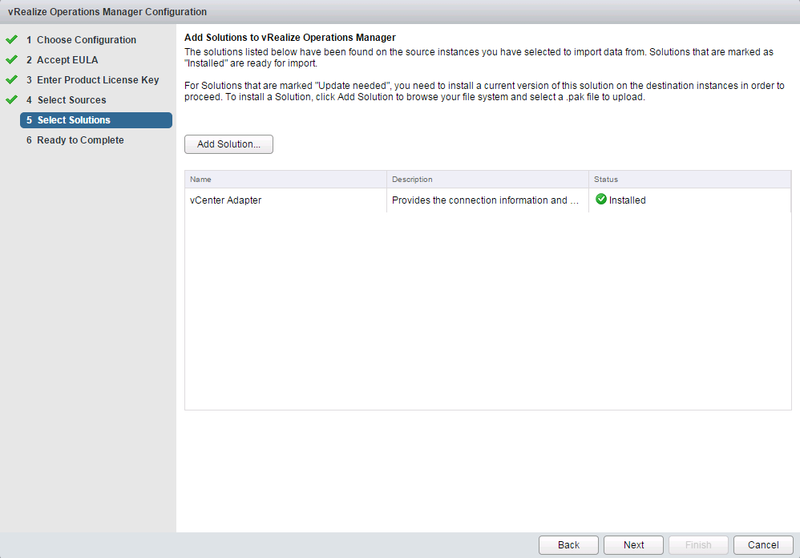 vCloud Suite Standard, vSOM Standard and vROps Standard together in one deployment. You can’t deploy Standard with either an Advanced or Enterprise, e.g. 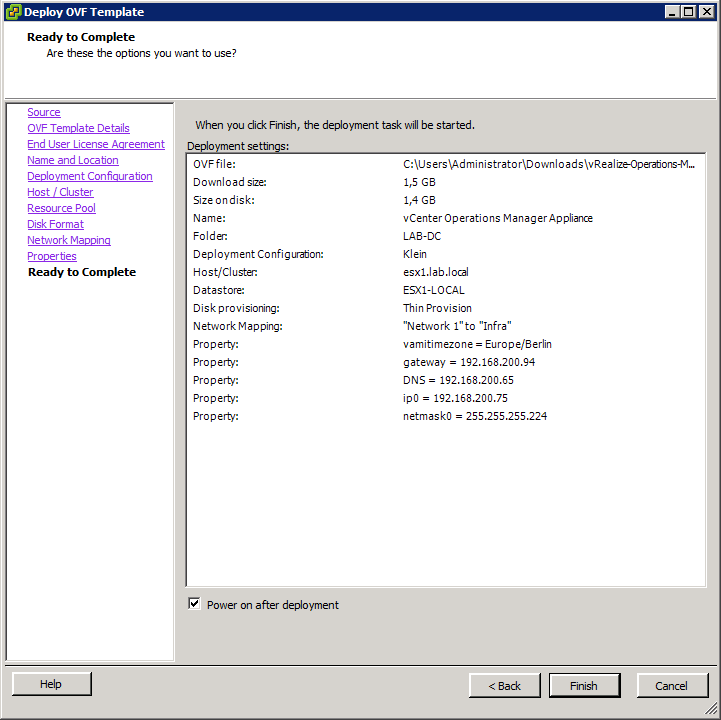 vCloud Site Standard and vSOM Advanced or vROps Advanced/ Enterprise. You can deploy vROps using a virtual appliance or on top of RHEL or Windows using suitable installation packages. I would always prefer the appliance deployment. A big advantage is, that the new vROps appliance is a single appliance, not a vApp. Especially in environments without DRS deploying the vCOps vApp was pain. You can deploy vROps on every ESX/ESXi host running version 4.0 or later that is managed by a VMware vCenter Server 4.0 Update 2 or later. I used the good old C# client to deploy the appliance. 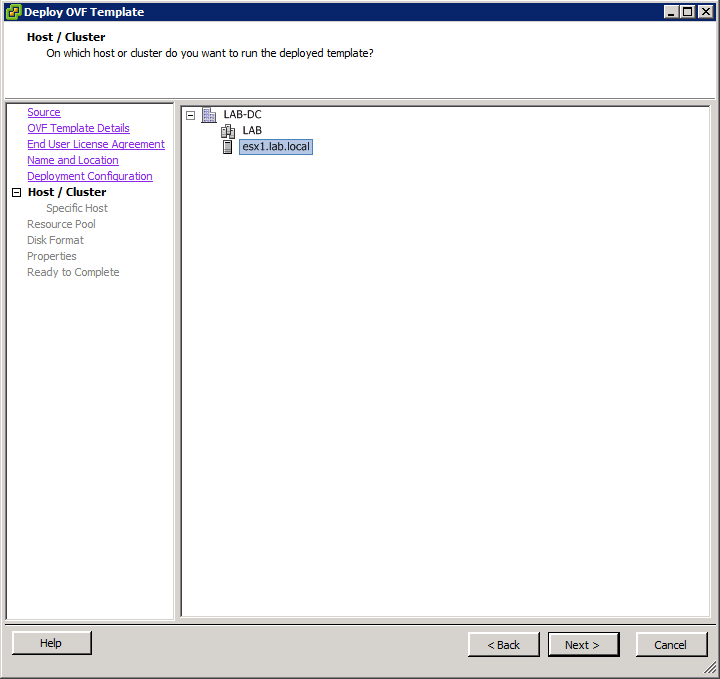 ;) Start with selecting “Deploy a OVF Template” from the vSphere client. Simply click “Next” to get to the EULA. Carefully read the EULA and click “Accept”. Then click “Next”. 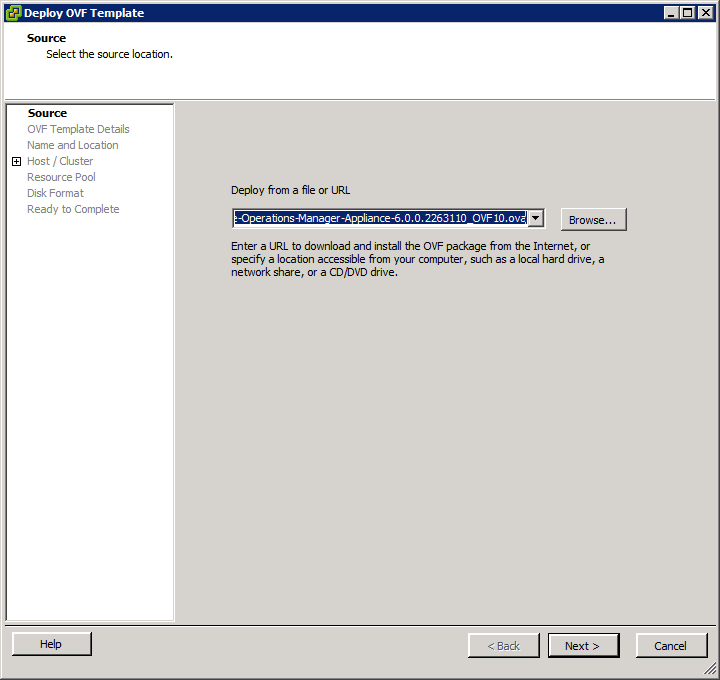 Enter a new name for the vROps appliance or accept the default name. 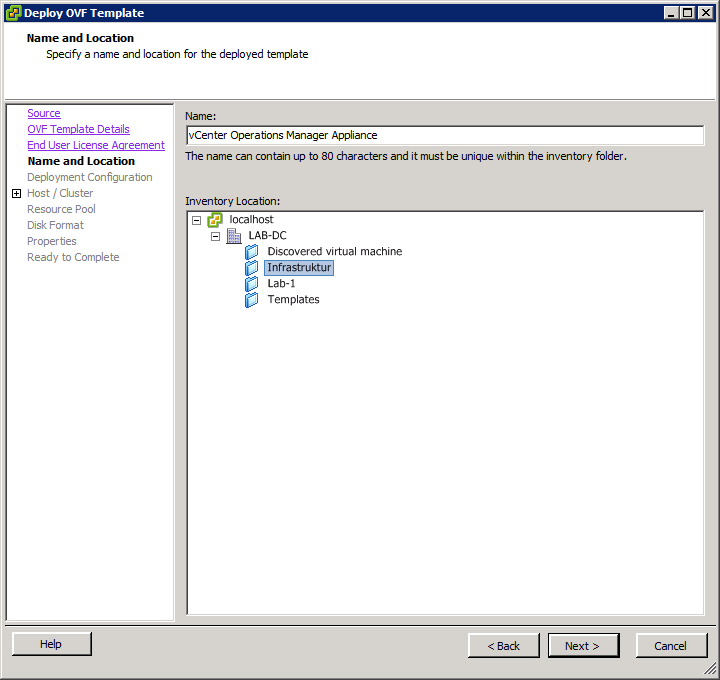 Select a location for the VM. Select the configuration. 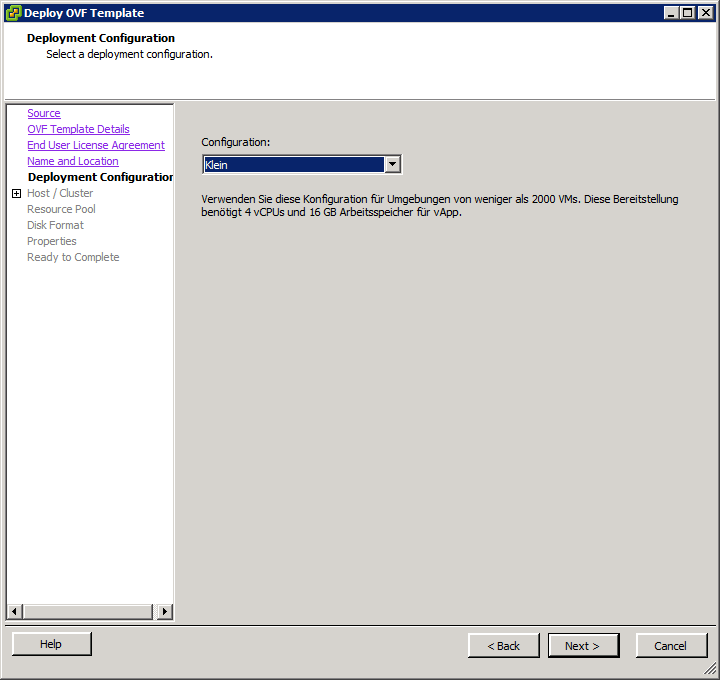 If your environment consists of equal or less 2000 VMs, select “small”. 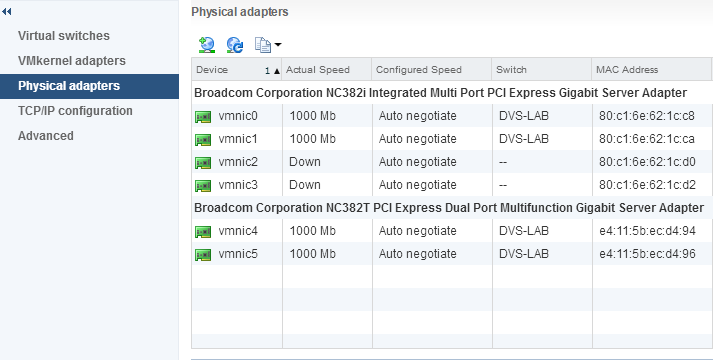 In this case the appliance will configured with 4 vCPUs and 16 GB memory. This is equal to the resources of the old vCOps vApp construct. 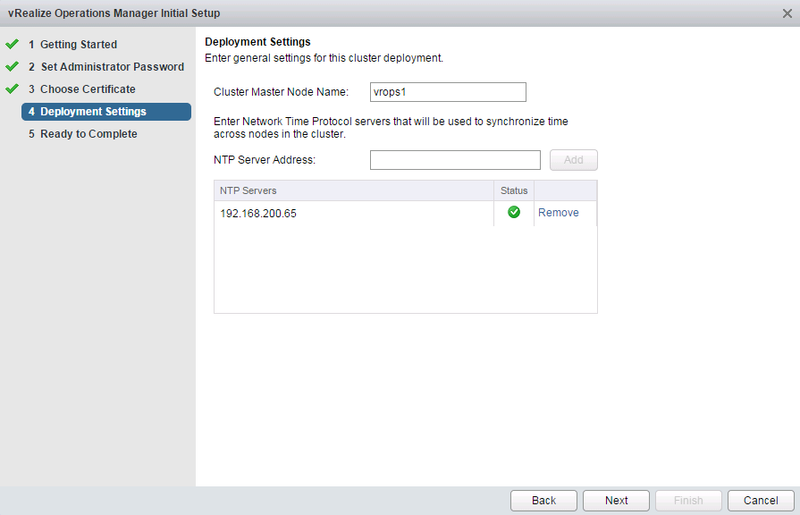 Select the host or the cluster into the vROps appliance should be deployed. I selected my management host. Select a resource pool if you have RPs configured. I deploy my VMs always thin-provisioned in my lab. 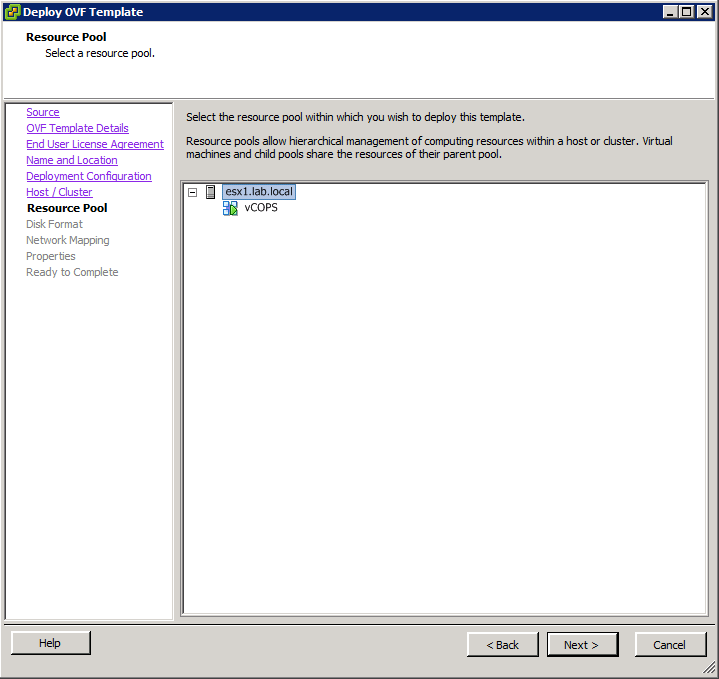 Select an appropriate disk format for your deployment. Choose the port-group to which the appliance should be connected. In my case it’s my infrastructure port-group. Now we need to add IP, subnet, gateway, DNS and time zone. Make sure that this applies to the port-group you have chosen one step earlier. Double check your settings and click “finish”. Depending on your equipment, wait a couple of seconds, get yourself a coffee or go out for a walk. Congratulations, it’s a vROps! At this point is the initial deployment finished and we can proceed further. As you maybe noticed, there was already a vCOps deployed in my lab. At this point a vCOps 5.8.x and a vROps 6.0 were running in my lab. Time to migrate vCOps to vROps. This process is covered in part 2 of this series.